Allied Telesis'WebSmart switch integrates the simplicity of unmanaged switches with the performance and reliability of managed switches to provide a cost-effective solution for users to integrate management at the edge of their network.This WebSmart switch provides a network manager some key features using the simple web-based management function such as; port-based VLANs, IEEE 802.1p QoS, port trunking/link aggregation, port mirroring, priority queues and IEEE 802.1x security support. With support of up to 8K MAC addresses and a 2MB packet buffer the AT-GS950/24 WebSmart switch is an ideal option for integrating management into your network solution. 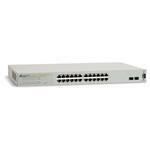 Never thought you could afford managed switches in your network? Always wanted to provide management functionality at the edge? Now's your chance. Allied Telesis'WebSmart switch truely helps network managers get the most value for their dollar. With industry standard protocols, fiber media support via the SFP's and simple Plug & Play usability right out of the box how can you go wrong implementing this cost-effective solution into your network.